Be the best house on the block, even at night! Energy efficient LED lighting. This green approach to lighting not only saves customers up to 65% on energy costs, but it also eliminates the constant maintenance of changing bulbs on standard lighting fixtures. Each LED lighting fixture has a 40,000-hour lamp life, which at five hours of operation per night would be the equivalent of twenty years. Solid brass, copper, and cast aluminum lighting fixtures are more durable than other competitors and are made to withstand weather variables encountered on a daily basis. Backed by a fifteen-year manufacturers warranty, these attractive fixtures are proven to be lighting you can rely on for years to come. Professionally installed outdoor lighting is one of the most affordable ways to increase the beauty and comfort of your home. Fisher Irrigation and Lighting are proud members of Kichler’s Presidents Club Executive level, an honor no other lighting designer in our area can claim. We are a certified low voltage lighting design and installation company, with yearly continuing credits to maintain this certification. Every one of our lighting designs is a custom creation, conceived in collaboration with our clients. When considering a lighting designer don’t be fooled by a company that jumps back and fourth between mowing lawns and designing lights. Fisher Irrigation and Lighting has a dedicated and knowledgeable lighting division ready to set your home apart from the others. Increases curb appeal. Outdoor lighting increases the value and resale of your home while complimenting your landscaping investments. Energy and cost efficient. 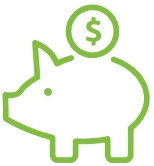 Low voltage, 12-volt lighting systems are less expensive to install and maintain, and burn 80% less energy than high voltage lighting system, which operate at 120 volts. Installation with minimal disturbance. 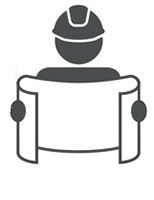 No disturbance to your landscaping or property. 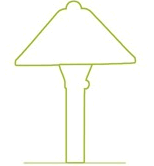 All lights are installed by hand, which allows us to avoid any disruption to your property. Added sense of safety and security. 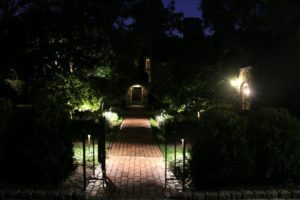 An experienced lighting designer can create a nighttime atmosphere that adds safety to your home by lighting up walkways and entertaining areas to freely move around in. A well-lit landscape has also been statistically proven to discourage trespassing and burglaries. 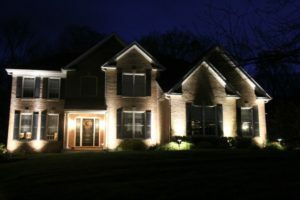 Set your home apart: Fisher Irrigation and Lighting deploys a wide assortment of custom lighting techniques that focus on enhancing your homes exterior features and garden areas to create warmth and ambiance to make your home stand apart from the others. Be the best house on the block, even at night! Call Fisher Irrigation and Lighting Systems today to schedule a free lighting demonstration at your home with one of Fisher Lighting’s own Kichler Lighting certified designers. For more lighting photos, please check out our photos section.